Swinton, Katherine. "Brian Dickson". The Canadian Encyclopedia, 16 December 2015, Historica Canada. https://www.thecanadianencyclopedia.ca/en/article/brian-dickson. Accessed 22 April 2019. Robert George Brian Dickson, chief justice of Canada (b at Yorkton, Sask 25 May 1916; d at Dunrobin, Ont 17 Oct 1998). 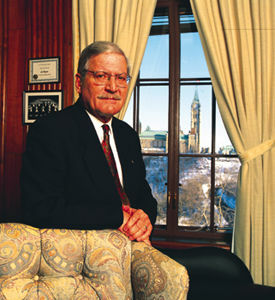 Robert George Brian Dickson, chief justice of Canada (b at Yorkton, Sask 25 May 1916; d at Dunrobin, Ont 17 Oct 1998). As chief justice of Canada from 1984 to 1990, he has had an important role in the initial interpretation of the Canadian Charter of Rights and Freedoms, which came into effect in 1982. After graduating from the U of Manitoba Law School with the gold medal in 1938, he was called to the Manitoba Bar in 1940. He served with distinction with the Royal Canadian Artillery 1940-45 and was seriously wounded during the invasion of Normandy. He practised corporate law in Winnipeg 1945-63, when he joined the Manitoba Court of Queen's Bench. In 1967 he was appointed to the Manitoba Court of Appeal, and in 1973 he became a member of the Supreme Court of Canada. 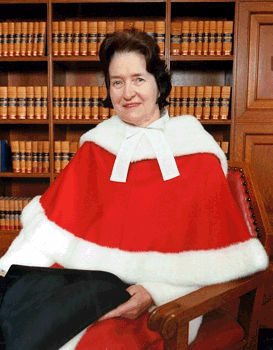 In 1984 Dickson became chief justice. He was well known for the clarity and thoughtfulness of his written judgments and his willingness to consider material beyond decided cases, including academic writing. In his tenure as chief justice, the court tried to make itself more accessible; eg, it has permitted argument on motions for leave to appeal from areas outside Ottawa through closed-circuit television, and it has increased press access to proceedings. With the implementation of the charter, much of the Court's time was spent on constitutional and criminal law cases - areas in which Dickson wrote many influential judgments. Among the landmark decisions involving the charter handed down by Dickson's court were the decision in 1985 that the protection of minority rights under the charter could override such traditional legislation as the 1907 Lord's Day Act; the decision in 1985 that cabinet decisions were subject to review under the charter, thus overturning the tradition that cabinet decisions were not subject to judicial review; the decision in 1987 that a worker's guarantee of freedom of association protected his right to belong to a union but did not protect that union's right to strike; the decision in 1987 to strike down an entire section of the criminal code and thus eliminate the archaic "constructive murder" category of homicide, which brought Canadian criminal law into line with that of other Western countries; the decision in 1988 to strike down two sections of Québec's language law (Bill 101), a decision the Québec government circumvented by invoking the "notwithstanding" clause of the constitution; the decision in 1988 to strike down the whole of the section of the criminal code controlling the performing of abortions on the grounds that it violated the charter guarantee of life, liberty and security of the person; and the decision in 1989 that a fetus was not a legally recognized person. 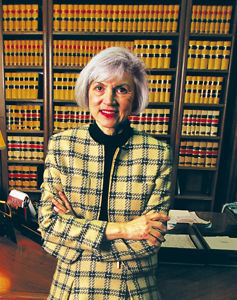 Dickson retired as chief justice in 1990 and was succeeded by Antonio Lamer. Dickson was selected in 1994 to sit on the NAFTA panels to arbitrate trade disputes.